This beautiful painting was created by Narcisse Berchère, based on his travels in Egypt with some of the most important Orientalist painters of the 19th Century. 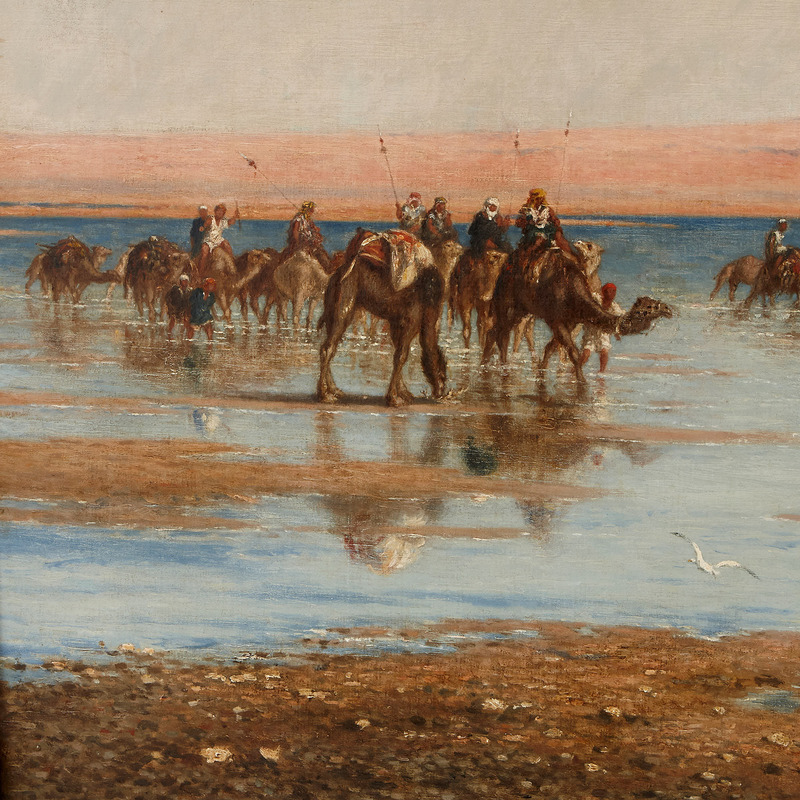 'Crossing the Desert' depicts a large group of people riding camels, emerging from a large body of water onto a sandy bank. The group on the left hand side of the composition, who walk out from the water, meet a second group, on the right, who have turned to face them. The men who ride, or lead, the camels wear headscarfs to protect their faces from the heat and sand. Several donkeys and a dog accompany the group. Behind the river in the background, a light orange-red coloured sandbank is visible. More than half of the composition is taken up by the cloudless blue sky. 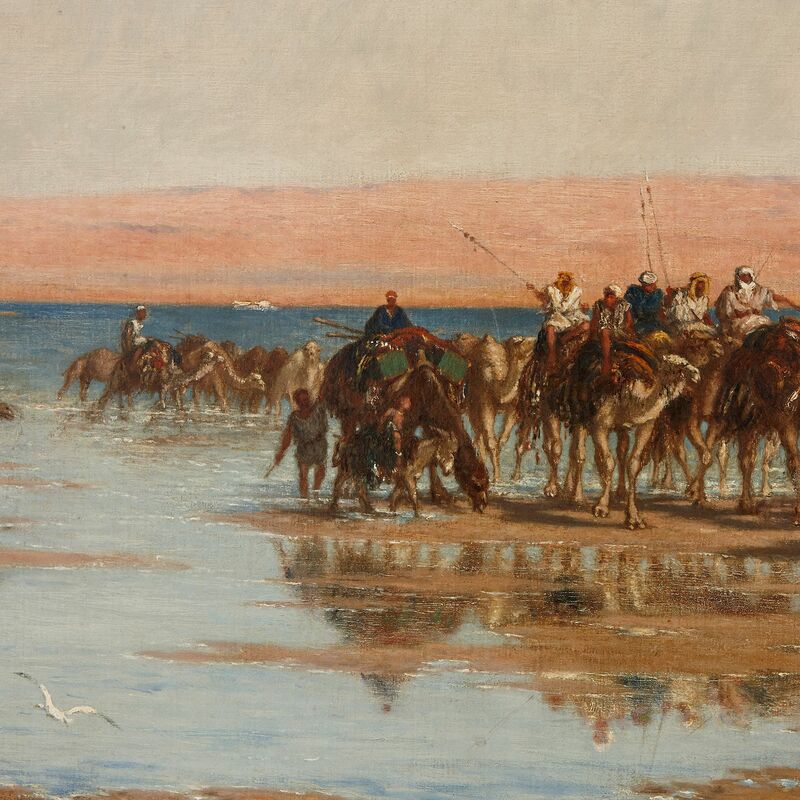 This scene was painted by the important French Orientalist painter, Narcisse Berchère. 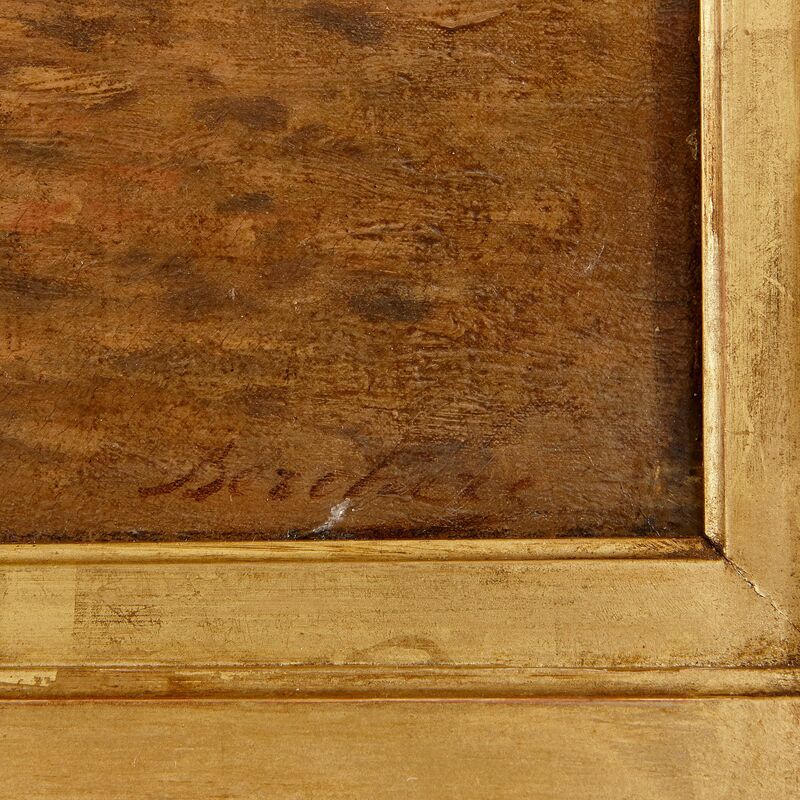 Berchère was based in Paris, but in 1849-1850, he travelled to Egypt, Asia Minor, the Greek Archipelago and Venice. 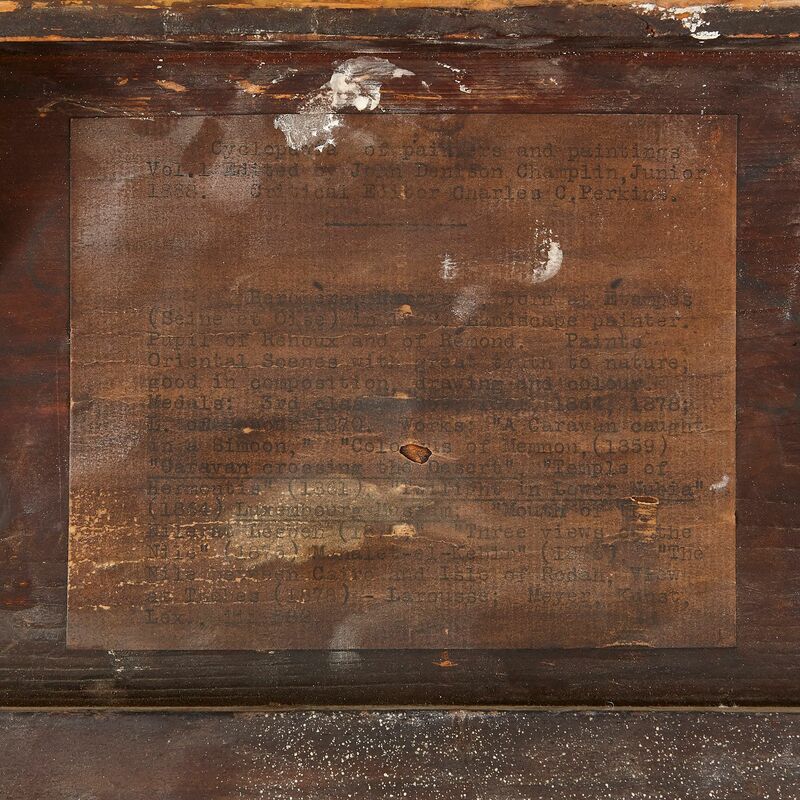 He sent the paintings he made during this journey back to Paris to be exhibited in the Salon and Paris Universal Exhibition of 1855. These images were well-received, and Berchère won a prize for his work at the 1855 Exhibition. 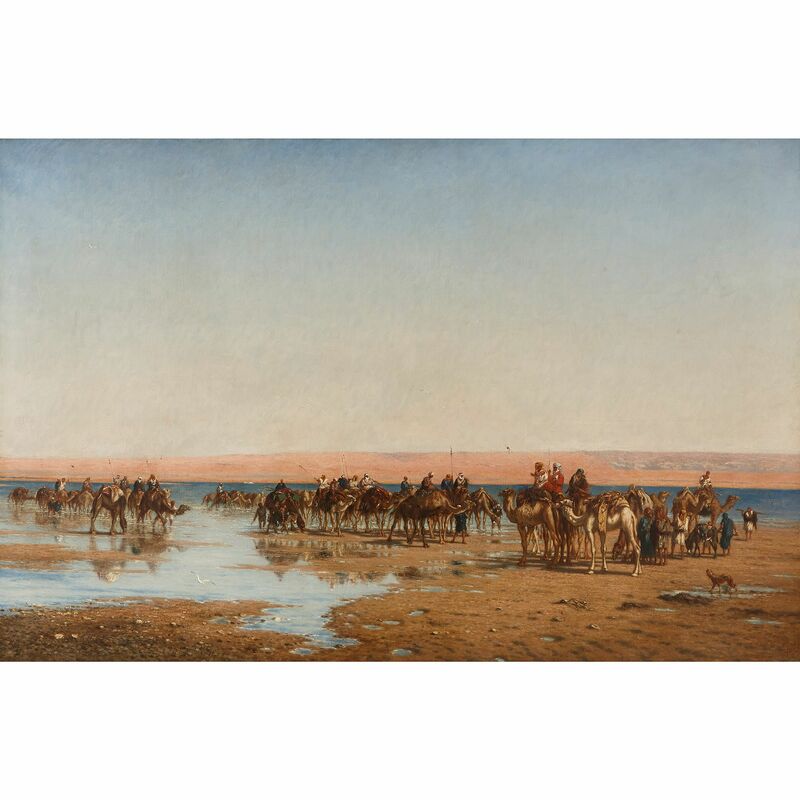 'Crossing the Desert' is most likely based on Berchère's experience of travelling across the Sinai Peninsula in Egypt. Berchère undertook the journey in April-May of 1856, accompanied by his friend and fellow artist, Jean-Léon-Belly. 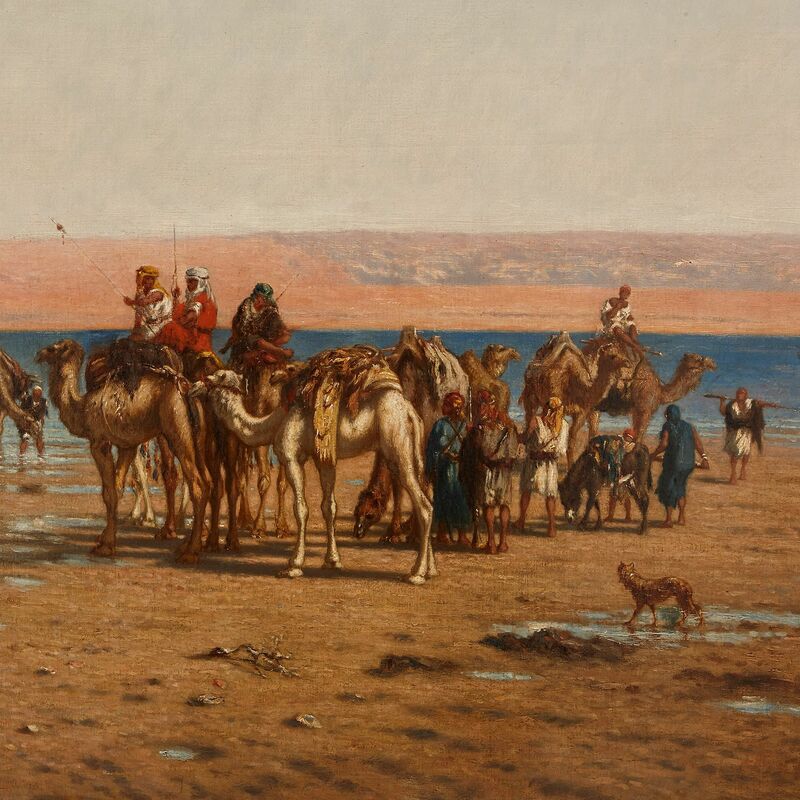 In the following months, Berchère and Belly travelled to Lower Egypt, with a group that included the famous Orientalist painter, Jean-Léon-Gérôme and sculptor, Auguste Bartholdi. In 1860, Berchère was chosen by Ferdinand de Lesseps to document the construction of the Suez Canal, which opened in 1869. In a letter to the painter, Eugène Fromentin, Berchère talked about the desert and his love of "its unexpectedness, its grandiose poetry, its mirages and shifting reflections", adding that, "...however stark and godforsaken it may appear, it is actually alive and throbbing with a life that is peculiar to it." 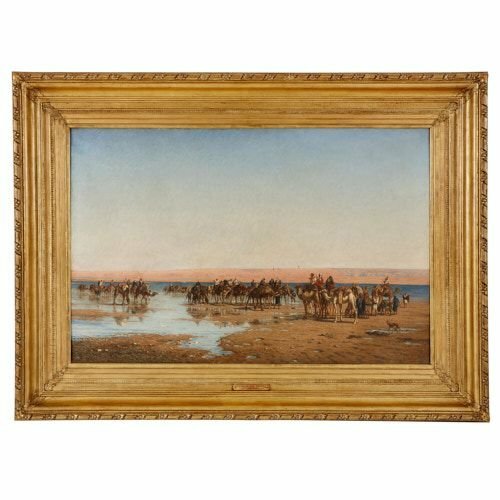 The landscape dominates the large canvas and it has been beautifully rendered, with the hot sun catching on the sand and reflecting off the surface of the water. 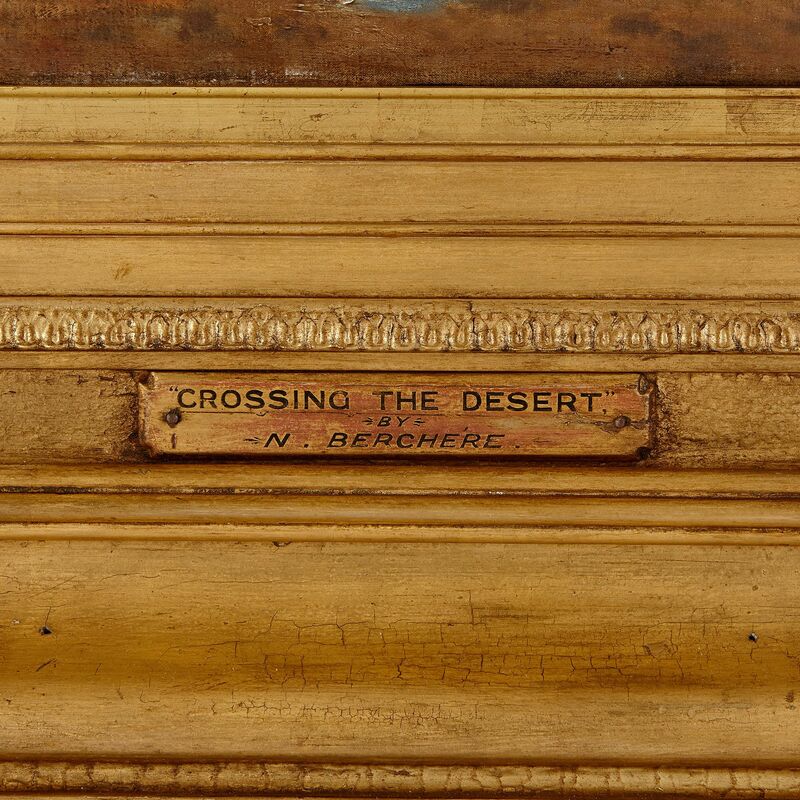 In this way, the painting truly captures the ‘grandiose poetry’ of the desert. Possibly C. C. Perkins & J. D. Champlin Jnr, Cyclopedia of painters and paintings, vol. 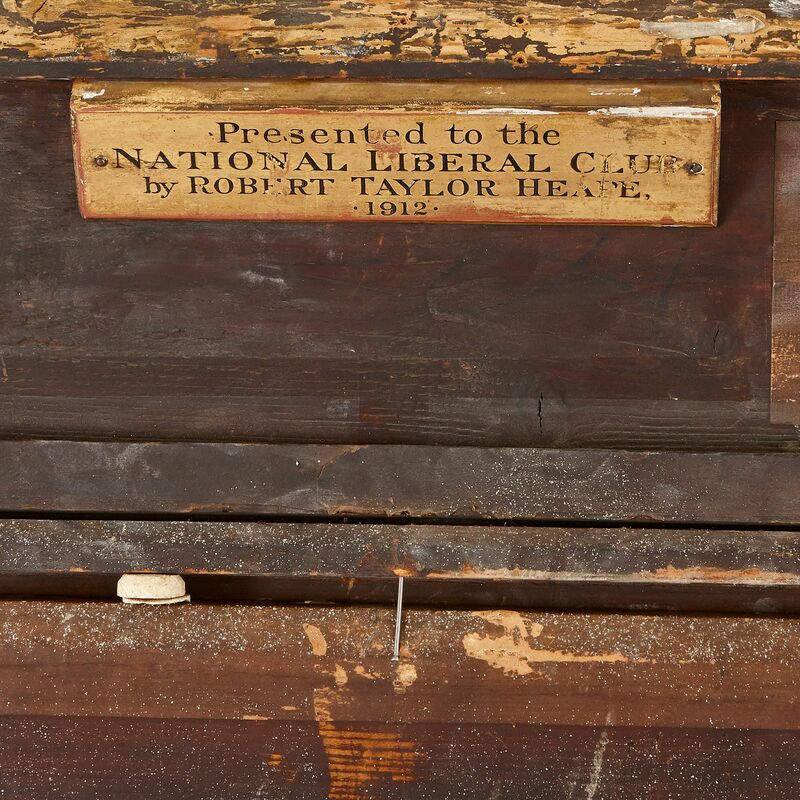 1, 1888, p. 143.